It’s been nearly a year since I chopped all my hair off into a pixie cut. In that time, I’ve tried several styling products — some clean, some conventional — and have finally arrived upon my favorite three products for keeping my short ‘do sassy and stylish. View what I used in the beginning and see how the pixie cut has evolved. I like the idea of using a heat-resistant spray, but coupled with what I actually need — a pre-heat styling aid to get my hair a bit gritty before drying and styling — I have opted to only use Living Proof’s Perfect Hair Day 5-in-1 Styling Treatment. Nope, it’s not “natural,” but it is free of sulfates, silicones and oils. The oil-free thing is necessary for someone like me with fine hair, so I don’t mind that bit of marketing (and you guys know that I love my hair oils — for overnight use only). 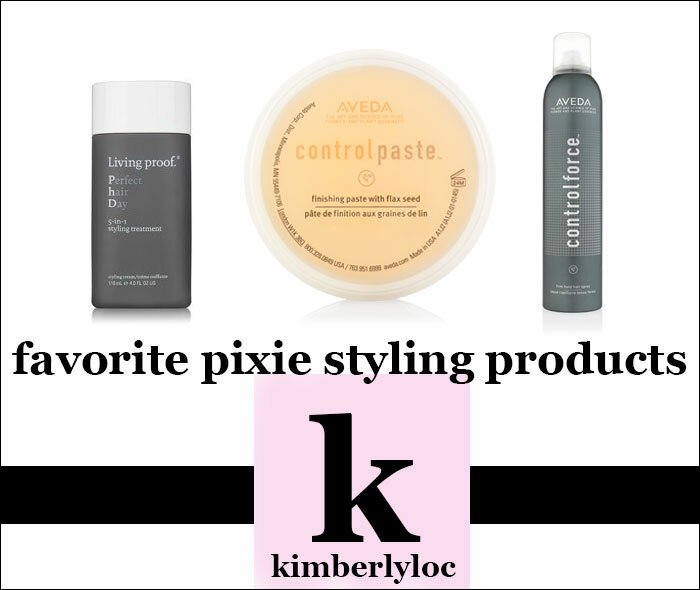 I happened upon Living Proof Perfect Hair Day 5-in-1 Styling Treatment via a swag bag I received during Kansas City Fashion Week back in March and have been using my trial size daily since then. It’s a repurchase for me (unless some clean beauty brand tells me it has something amazing that mimics this stuff!). After navigating the wonderful world of creams, pomades, pastes, waxes and so forth, I finally landed on one that has the perfect strength, consistency and performance for my fine, oily strands that tend to fly away and bend in funny ones: Aveda Control Paste. I’ve gone through two tubs of this stuff (purchased at my local Aveda salon, Xiphium, and as my favorite natural spa, Milagro Midwestern Spa & Collective, purged its Aveda inventory in favor of cleaner hair products). While yes, Aveda is part of big beauty now and could be a lot cleaner, I find that this sticky putty keeps my fine hair under control without weighing it down or making it look greasy. Side note: I was inspired to try Aveda Control Paste after seeing how well it held up a faux hawk on the young man behind the counter at Miette in San Francisco. Yes, I’m that girl who asks about all your beauty products when you’re just trying to sell me a sweet treat! In my previous post about pixie cut styling picks, I mentioned Davines N°7 Crystal Fixative Lacquer. I still like this hairspray, but have found that Aveda’s Control Force Hairspray has a better spray mechanism; it’s more evenly distributed in a fine, wide mist. Aveda Control Force Hairspray also has a slightly better hold (they weren’t joking with that “Control Force” naming!). Anyone with a pixie cut knows that the final spray around the head is essential to locking in a style; to have a hairspray that does this without making your hair hard / crunchy / helmet-like is an instant winner! Do any of my readers have pixie cuts? If so, tell me what you’re using and how it works for your hair type in the comments below!